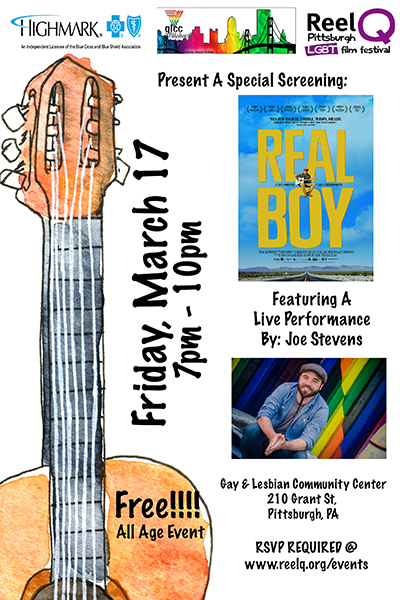 Reel Q is proud to present a special screening of Real Boy (2016 Audience Favorite Documentary) at the Gay & Lesbian Community Center. This screening is part of our Reel Youth program and is an all ages event. Following the screening will be a Q&A and performance by musician Joe Stevens (featured in the movie). Adults are welcome but must be accompanied with a minor. This event is made possible from a generous grant from the Highmark Foundation. The screening is free but please use the RSVP link to reserve your spot. We expect this event to reach maximum capacity so RSVP early! REAL BOY has screened at more than 70 festivals worldwide, received more than 15 awards, and will be broadcast on PBS’ Independent Lens in June 2017.